Jesus or Squirrel? : Squirrels are in Potato Chips too! 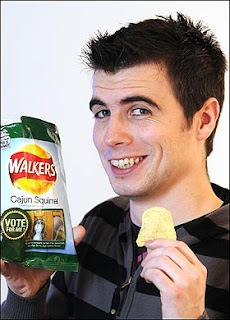 Not to be outdone by Jesus showing up in a Potato Chip in Pennsylvania, The Squirrel launched his own brand of Cajun-flavored squirrel chips in Great Britain. This reminds me why I don't live in the Bayou or in London.